The first Samsung Gear IconX felt like a taste of what was to come, but lousy battery life, semi-decent sound quality and other problems held them back from being a hearable we could truly recommend. 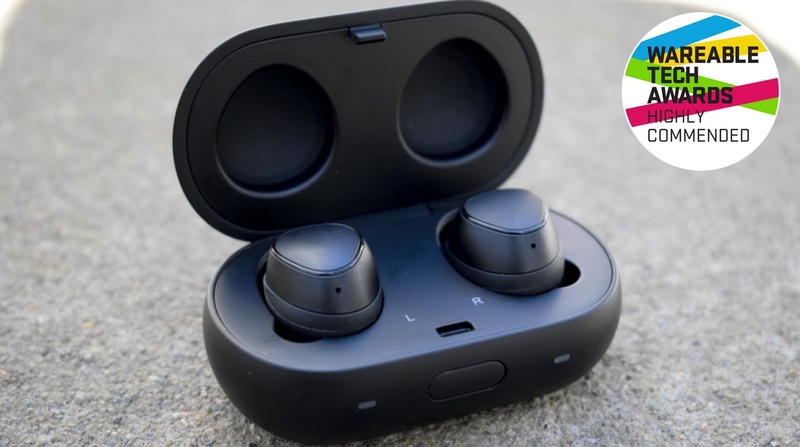 The second generation is a very different story: Samsung has nixed some of these problems, chiefly the battery life, and made a few other adjustments that make the Gear IconX (2018) one of the best hearables of the year. Samsung's competition doesn't just include the Doppler Here One or Bragi Dash but Apple's AirPods too. The AirPods aren't a "hearable" in the sense that we'd define the word – they do little beyond stream music and give you another a line to Siri – but they've sold like crazy and Samsung needs something that can take the fight to Cupertino. This year's Gear IconX do that with aplomb. There are still trade-offs that we'll get into, there isn't a hearable out there right now that can satisfy everyone, but Samsung's might be the most well-rounded we've tried to date. Read on for our thoughts on the new Gear IconX. The new IconX haven't changed much in terms of design, and that's fine by me. They're comfortable, lightweight and snug in the ear. The round, more traditional earbud design will continue to appease those who find Apple's headphones to be too toothbrush-esque, and this year's model comes in black, light grey or pink (RIP blue). I asked Samsung why, but it wouldn't tell me. Apparently pink is kinda in right now? You'll get a mix of tips and wings in the box to get the right fit and I've had no problems keeping a good seal even when running. I usually find the AirPods slipping out as my ears get sweaty, but damp lug holes haven't been a problem for the IconX. While I've only had a brief demo with Google's Pixel Buds, those don't insert fully into the ear, and Samsung's feel more comfortable. One difference you'll notice is that the heart rate sensor, which sat on the side of last year's IconX, has vanished. Samsung decided to drop this in favour of a larger battery, which feels like a shrewd trade-off considering it wasn't all that accurate anyway. If Samsung can't get it right, we'd rather have the bigger battery. Once again the IconX come in a pill-box case that doubles as a charger. A button at the front will pop the lid open and there's a button on the back for turning on Bluetooth visibility for pairing, while two lights on the front will turn from red to green to indicate the battery level of your headphones. It's a thicker case than the one Apple's AirPods sit in, which makes the IconX sit a little more awkwardly in a pocket, but it's hardly a dealbreaker. The IconX no longer track heart rate but they do still measure speed and distance data from runs. This is done through accelerometer data, not GPS, but the difference when put against the Fit2 Pro and Gear Sport was very small. Samsung has also included an onboard coach on the IconX. This isn't an in-depth coach like you'd find on devices such as the LifeBeam Vi, but it'll pitch in at intervals (that you can set) and give you a nudge to pick up the pace, or offer some words of encouragement. For running beginners it's good, but if it's a new personal trainer you're after, there are better AIs out there. Samsung's once again included touch controls on the IconX, and once again I'm ambivalent about my feelings towards them. Swiping up and down the left earbud will adjust the volume, a single tap will pause/play the track, a double tap will skip track or answer or end a call, and a tap-and-hold will decline it. It's a bit of a job remembering which does which, especially as a couple of these commands have more than one function. It's also easy to accidentally do something when just scratching your ear. Similar to the Bragi Dash Pro, I've find myself inadvertently starting an exercise or skipping a track. It's the curse of headphone touch pads and probably something I'll get better at with time. But even so, it can be finickity, especially when there's a delay between input and the IconX acting on it. The IconX also offer a line to your smart assistant, but it's a temperamental one at best. Naturally Samsung would like you to use Bixby but I've had it paired with Google Assistant on the Pixel, and most of the time I've found myself having to repeat myself or just getting dead air in response. I really hope this is something Samsung will fix, even though I might not use it all that much, because as it stands it's pretty poor. You've got 4GB of storage for putting music on, and you no longer have to just use your PC to do it. Samsung's added a wireless transfer option that lets you send stored tracks from your Android phone (this doesn't work on iOS) to the earbuds. For some unfathomable reason you can only send one at a time, and it's a bit slow, but still less hassle than plugging them into the computer. Overall, Samsung's got fewer features here than the $329 Bragi Dash Pro, but at $200 they're also a darn sight cheaper. A few of Bragi's features (like the 4D menu) are also kinda throwaway, though Bragi does provide a bit more on the fitness front with heart rate and the ability to withstand some light swimming. Rarely do we expect sound quality to blow us away on a hearable, but the IconX have surprised us with a step up on last year's attempt. Clarity is good, especially at the midrange, though I wish they were warmer. True audiophiles will probably have more to pick at here, but next to Bragi's, Jabra's and Apple's options, Samsung's new headphones do an admirable job in the sound department. In the past week they've replaced the AirPods as my go-to headphones, and I expect it'll stay that way for a while. The audio passthrough mode, titled 'Ambient sound', is designed to let you hear your surroundings through the music. This works by amplifying sounds around you, but annoyingly you can only activate or deactivate it through the phone, not the earbuds themselves. That somewhat defeats the point, as I discovered when queueing up to order a coffee, smugly thinking I was going to be able to talk to the barista without taking out my earphones and instead finding it took longer to go into the app and toggle ambient mode on than it did to just take them out. Doppler did this better – Samsung, take note. Here, it's better as a safety feature for when out running, but certainly doesn't stand up to the Here One's passthrough. You also can't adjust the level of leakage on the IconX, so it's either on or it's off. Annoyingly, there are still some Bluetooth problems that rear their head from time to time. Our review was delayed by some connectivity issues (including a pair that inexplicably just stopped working and had to be replaced), but Samsung has fixed most of these in subsequent updates. The connection still isn't perfect; post-update I'm no longer getting full connection drop-outs (make sure you're up to date by checking the Gear app), but I'm getting the odd random bit of interference and the occasional stereo channel hiccup where sound is heavier on one side than the other. As I say, these problems have already improved with early updates, but some are still niggling away that Samsung will hopefully put an end to. Battery life is vastly improved on the new IconX, up from the hour-and-something of the first pair to five hours when streaming, and seven when playing music locally. That means Samsung has tripled the amount of charge from the first, and it's so much better for it. I've found myself rarely being caught short, and the case will charge the IconX up when you're not using them. The case charges with USB-C, which might seem oddly inconsistent with its other devices (the Gear Sport and Fit2 Pro both charge via micro USB) but this is what lets the IconX charge up so fast. Just 10 minutes in the case will give you around an hour of life. The Gear IconX (2018) are a vast improvement on last year's model with an excellent battery life that won't disappoint. Less capable in fitness, sure, but the trade-off is a smoother, better overall experience. There are still a few connection hiccups, especially with assistant controls, but otherwise Samsung has delivered a hearable that's leaps and bounds ahead of the first.